Traffic Washington DC will shorten your commuting time! Concerned about getting stuck in rush hour? 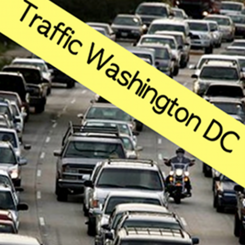 Use Traffic Washington DC to check the status of traffic along your commute before you head out. Traffic Washington DC will shorten your commuting time!Concerned about getting stuck in rush hour? Use Traffic Washington DC to check the status of traffic along your commute before you head out. Traffic Washington DC displays the traffic cameras provided by the District of Columbia Department of Transportation. Simply browse the list of intersections, or alternatively open the handy map displaying all the traffic cameras in the Washington DC area, and choose the camera to view. You can refresh the camera display as well as add specific cameras to you favorites list.Choose the least busy route home and never get stuck in traffic again! An internet connection is required. To download the iPhone version of this app, click here. To download the iPad version of this app, click here. To download the Android version of this app, search for “SK8 Wireless” in the Android Marketplace on your handset. To download, click the link below.